I was strolling through my local garden store this weekend when I came across this perfect fall combination of Sedum ‘Autumn Joy’ and Pennisetum ‘Little Bunny’ (can also be substituted with ‘Hameln’). Now that Labor Day has passed, it is time to give the garden a spruce up for autumn. Sedum ‘Autumn Joy’ is appropriately named for the jubilant explosion of pink flowers beginning in late August and continuing for a good month into the end of September. The color ranges from light pink to almost pale purple depending on the exact variety (‘Autumn Joy’ is just one of many fall blooming sedums). 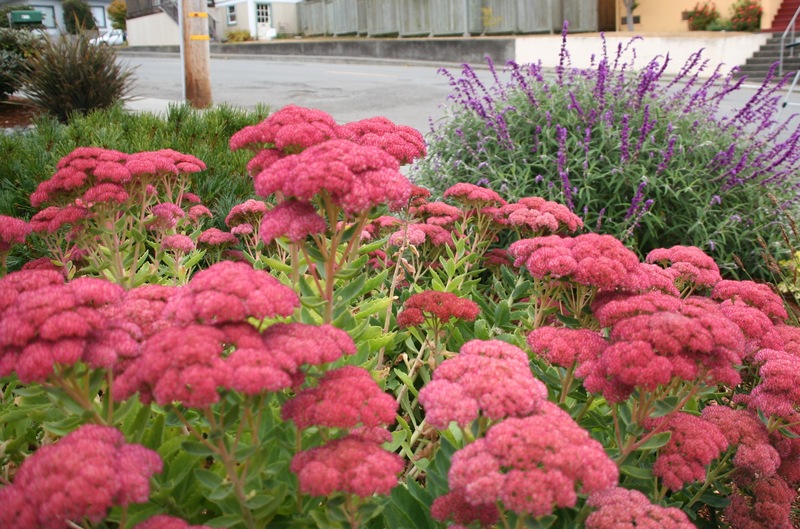 This particular sedum grows to be about 2-3′ tall and 2-3′ wide. The pale lime green leaves appear in early spring and provide a contrast of green within the garden during the summer months. The flower buds are a very light version that also brings some interest. Use ‘Autumn Joy’ in the perennial borders and beds paired with other fall interest plants such as the Pennisetum pictured above or rudbeckias. Make sure to aggressively deadhead early flowers to stimulate new growth on the plant which will produce an even bigger spectacle in autumn. Pennisetum ‘Little Bunny’ or ‘Hameln’ look almost identical with wispy green blades in the summer giving way to feathery flower plumes in late summer. The flowers on this fountain grass, are reminescent of bottle brushes but are much softer to the touch. The main difference between these two varieties are height. ‘Little Bunny’ makes good on its name with the height and width of about a foot. For greater impact in larger spaces, use ‘Hameln’ because of its height of 2-3′ and width of 3-4′. All of these plants are very readily found in your local garden store or market, especially now when they are in their peak season of interest.